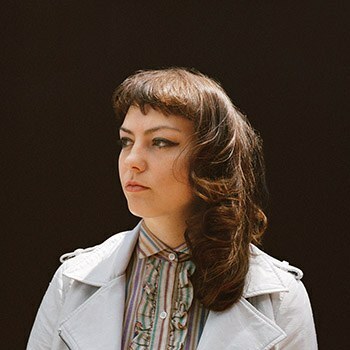 Angel Olsen elaborates on the disparate missions of her last two releases while reaching out to new stylistic territory on My Woman, her most dynamic album yet. Angel Olsen won’t let herself get pinned down. She refuses to conform to the common career archetypes of up-and-coming indie musicians, she resents comparisons to her contemporaries (as if she isn’t her own distinct personality), and she won’t settle for maintaining a particular sound that’s all her own—she wants to subvert expectations at every turn, too. Somehow that wasn’t fully apparent until now. Look at the history. Her first two releases on Bathetic Records, Strange Cacti and Half Way Home, consisted aching acoustic folk—one of the most staid, traditional styles that can still garner you a following in the 21st century—but, like the best, she made the genre her own while still playing by its somewhat stifling old-fashioned rules. Her distinctive voice, prone to charming human imperfections like breaking on high notes and cutting out on low notes, not to mention a mild vibrato underscoring every phrase, became one of the signature quirks that elevated her above the baggage associated with being a classical singer-songwriter in an era of disparate auteurs in every imaginable musical niche. Most importantly, those early releases proved her unique talents as a writer, both lyrically and melodically; Olsen’s biggest gift seemed to be her ability to pull a sweet refrain from where few others could: the rubble of stark emotion, heavy-hearted sentimentality, and swooning sincerity, adorning her mournful songs with gorgeous hooks and infectious, subtle melodies. Although it alerted many to Olsen’s presence and ultimately set the stage for her future recognition, Half Way Home remains one of the most woefully underappreciated albums of the last few years, but its legacy is helped by knowing where Olsen has traversed since. It wasn’t apparent in 2012 the kind of artist Olsen would evolve into, whether she would remain one of indie folk’s standout artists or whether she would develop a keen interest in the higher production values and wider reach of pop music, as so many seem to do. Both avenues had equally strong potential for her. She ultimately followed neither of those well-charted courses. Burn Your Fire For No Witness, the 2014 follow-up to her short term with Bathetic, was a profoundly different but equally significant affair that opened Olsen to the wider audience and critical acclaim she enjoys today. It was proudly ambitious in its blend of approaches; it opens with the soft, lo-fi delicacy of the acoustic “Unfucktheworld”, which leads into the fuzz distortion and trampling drums of the heavily ‘90s alt-rock-flavored “Forgiven/Forgotten”, which in turn gives way to the retro tremolo guitar build-up of “Hi-Five”. Over the course of the album, Olsen hits maudlin lows (“White Fire”) and dreamy, transcendental highs (“Stars”) without so much as a moment of rest in-between, never fully abandoning the wispy folk orientation of her artistic origins but obscuring it with gentle precision. The album was a declaration of the versatility that a limited budget and insufficient resources prevented her from flaunting from the very outset of her career, as well as a fevered investigation into the extent of her own stylistic horizons. It was an understated renunciation of the severe traditionalism generally associated with folk music in the modern age. Now two years have passed—the same span of time it took Olsen to transition from underrated, tender-hearted folk crooner on Half Way Home to indie rock’s hottest singer-songwriter talent on Burn Your Fire—and My Woman presents an Olsen even further along in her progression as an artist than expected. On June 1, Olsen debuted her first new material since Burn Your Fire For No Witness—what would be My Woman’s opening song, “Intern”—with a video of close-ups on Olsen singing with a deadpan expression, donning crisp red lipstick and a silver tinsel wig, looking just a bit like a tormented Laura Palmer in a strange, uncharacteristic bit of costumed abstraction unsuited to the austere authenticity of both the acoustic folk and alt-rock Olsen was becoming known for. Even more astonishing was the music, marked by a flock of dreamy synthesizers and a subtly haunting falsetto notably devoid of Olsen’s signature vibrato—moves that made some Olsen loyalists uneasy, to say the least. Had the allure of pop accessibility claimed her as they feared? Expectations shifted once again at the end of the June with “Shut Up Kiss Me”, the album’s first proper single, which dropped the synths, picked up the crunchy electric guitars where “Forgiven/Forgotten” left them two years ago, and reintroduced Olsen’s original unprocessed vocals. The song was different, too, but in a great way; Olsen’s mind for hooks was put to good use on the song’s instantly catchy chorus, and her lyrics were more commanding and assertive, still intimate and confessional but confident rather than vulnerable. In a way, “Shut Up Kiss Me” was Olsen’s biggest push forward into guitar pop yet with its determined attitude and smartly crafted melodies, like a more approachable take on “Hi-Five” or “High & Wild”, but it was still quintessentially Olsen. As always, doubters remained, but those married to their idealized conception of Olsen circa Half Way Home or Burn Your Fire For No Witness would do well to open their hearts to every moment of My Woman. Those dismayed by the lack of guitar in “Intern” will be happy to learn that the album features guitar in every song but its introduction, as well as a multitude of fiercely dynamic guitar solos that elevate Olsen’s emotionality like never before; likewise, those worried about the potential abandonment of Olsen’s unmatched traditional ballad songwriting will be happy to learn that the entire B-side of the record is one brilliant slow song after another, each one unique and each one genuinely breathtaking at various moments; and those made anxious by the loss of any single quality that makes Olsen wonderfully different will be happy to learn that not only are all her greatest idiosyncrasies on flattering display throughout My Woman, but the album offers dozens of new reasons to fall deeply, unreasonably in love with her music. The same classic melodicism on display in “Shut Up Kiss Me” bleeds through “Never Be Mine”, a song that lands somewhere between ‘60s blue-eyed soul and contemporary beach rock with that particular style of simple hooks that has served Best Coast and the Dum Dum Girls, and “Give It Up”, which would have fit nicely in the first half of Burn Your Fire For No Witness. The reverb-drenched “Not Gonna Kill You” howls with urgency while “Woman” and “Heart Shaped Face” return the album to calm at different points of momentum. Then there’s the nearly eight-minutes-long “Sister”, with its tender Fleetwood Mac-esque refrain during an epic build-up that features the album’s most dramatic guitar solo, which is undoubtedly a showstopper, but its soulful follow-up, “Those Were the Days”, which finds Olsen adopting beautifully hushed vocals and glistening guitar delay, may be even better. Each song finds Olsen either further developing or integrating for the first time some unique musical mannerisms in her arrangements, and because of her meticulous finesse, it almost always works. With the breathtaking decompression of piano ballad “Pops”, Olsen ends My Woman where her recording career began: with just her and a single acoustic instrument, viscerally crying out, voice cracking when she hits a note a little too hard, beautifully elegant chords cascading down to the album’s final moments. The song’s raw, lo-fi charge brings to mind the simplicity of Strange Cacti and the organic, unadorned edge of “Unfucktheworld”, a track that almost seemed like hedging at the beginning of what was her most stylistically varied release before this point. After the emotionally dynamic journey of the rest of My Woman, “Pops” is the perfect bookend to contrast “Intern”, the opener, a song to which it couldn’t be more aesthetically opposed but which revels in Olsen’s personality just the same. Contained between the two most dissimilar songs on the album—perhaps even in her catalog—is the phenomenal breadth of her vibrant artistic voice. In any case, My Woman is a new watermark for Olsen. It somehow elaborates on the disparate missions of both Half Way Home and Burn Your Fire For No Witness while reaching out into the unfamiliar spaces of dreamy synthpop and more hook-driven, pop-oriented songwriting. Yet the most remarkable thing about My Woman is that it all coheres (far better than Burn Your Fire For No Witness, as great as it was, ever did) into an expansive, all-encompassing vision. To say My Woman is a “transformation” of Olsen’s character is to ascribe to her career a narrative that doesn’t quite fit. Olsen had a lot of choices with this album: she could have gone full dream pop, invested more heavily in her ‘90s alt-rock influences, or even—though it was unlikely—gone back to her roots and wholly embraced the “fresh-faced folk starlet” persona with which the music press first baptized her. Instead, as a credit to her immense talent, she kind of did it all. But mostly she just took all of those misguided expectations and cast them away, opting alternatively to remain true to her own independent ideals. As if it even needs to be said, she clearly made the right decision.